It was reminiscent of two great thoroughbreds with contrasting styles going eyeball to eyeball, snorting and grunting through the stretch after leaving the competition gasping for air in their wake. Matt Hansen was the grinder who lagged off the pace, then barreled toward the finish line the picture of determination. Jake Johnson was the front-runner who, when engaged for the lead, showed he wasn’t just fast, he had plenty of fight, too. 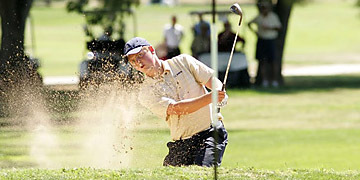 In a golf equivalent of a photo finish, Hansen sank a 25-foot birdie putt on the final hole Monday at Haggin Oaks to win the California State Fair Amateur Men’s Championship by one stroke over Johnson. The outcome wasn’t official until Johnson missed a birdie attempt from 10 feet that would have resulted in a dead heat. “All I was thinking was I had to make that putt to get into a playoff,” said Hansen, a baby-faced UC Davis sophomore from Los Osos. His birdie capped a final round of 6-under-par 66, and his 54-hole total of 17-under 199 tied the tournament record. Johnson, a Cameron Park resident and Sacramento State senior who shot a course-record 60 in the first round to lead by seven shots, finished with a 68. Arbuckle’s Ben Geyer (69) and Cal teammates Joel Stalter (69) and Pace Johnson (65) tied for third, four shots off. Hansen and Johnson were tied since the 13th hole, when Johnson made a birdie following a double bogey that knocked him out of the lead for the first time since Saturday. Both players stuffed approach shots within four feet on No. 16 and made birdies. Both recorded two-putt birdies on the par-5 17th (No. 4 during public play). It was a two-horse race. On the par-5 No. 18, Hansen narrowly missed the green to the left on his second shot, and Johnson was a few yards long. Johnson played first and hit a so-so chip shot to within 10 feet. Then Hansen stumbled. He chunked his chip shot from an iffy lie in the thick rough, his ball failing to reach the green. “I had some not-so-great thoughts going through my head,” he said. He opted to putt his fourth shot through about six feet of fringe, saying the decision not to chip was partly predicated on his previous gaffe and partly because the turf between his ball and the hole was smooth. Johnson’s tying attempt skirted the left edge of the cup. The crowd favorite took the defeat in stride, as he has everything since placing a target on his back with his eye-opening first round. “The great thing about this game is that you get to come out and try it again tomorrow,” he said. Hansen, methodical and deliberate, carried his bag and stayed to himself. He was consistently outdriven by 40 yards. Johnson, a big hitter off the tee and quick to pull the trigger on the greens, chatted all day with his coach and, seemingly, everybody else. Hansen had his mom and a few UCD coaches pulling for him. Johnson is a Hornet who had the overwhelming support of the crowd. Hansen has his name on the 70-year-old State Fair trophy. Johnson has a course record and lots of buzz. Hansen and Johnson both ran a winning race, but Hansen got his nose in front at the end. “It was a lot of fun,” Hansen said.